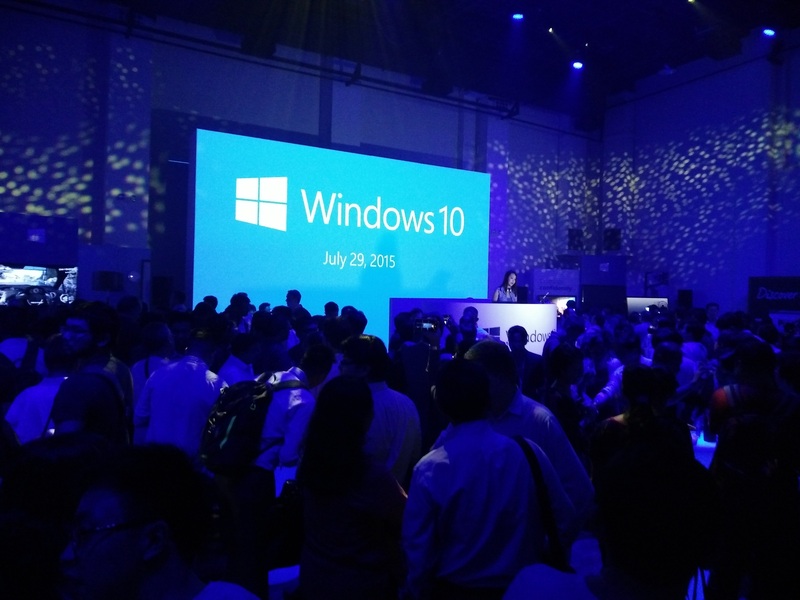 29 Jul 2015 was the official launch of Microsoft Windows 10. To celebrate the launch, Microsoft organised a party at 72-13 Singapore. To most techies, Windows 10 was no stranger as it was on beta for several months prior. I did not join the beta program, only choosing to receive the final consumer release version like the most other consumers. Am I Eligible for Free Windows 10? 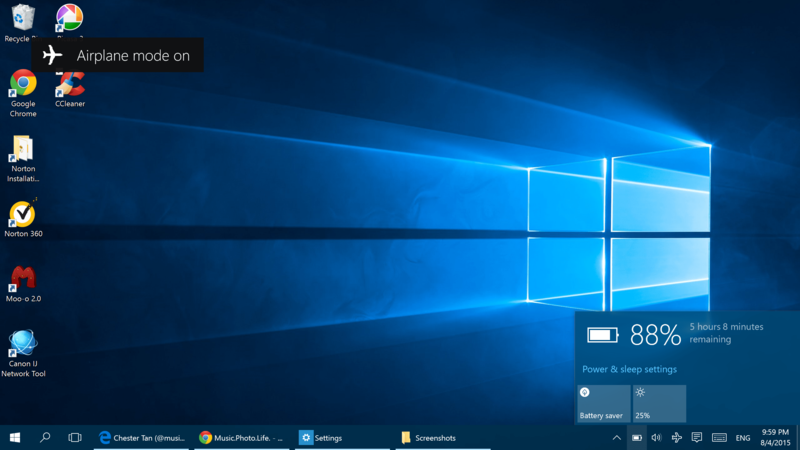 If you have been updating your Windows 7 or Windows 8.1 OS regularly, you would have noticed a special Windows 10 icon on the taskbar, which persuades you to “reserve” a copy of your free Windows 10. In that case, congratulations, you can upgrade to Windows 10. The version of Windows 10 depends on the current Windows version. If you are using Windows 7 Pro or Ultimate or Windows 8 Pro, then you can upgrade to Windows 10 Pro. Otherwise, it’s Windows 10 Home. Like most other eager consumers, during the first week of its launch, I visited the Windows 10 download page and downloaded the Download Tool. It allows you to create either an ISO image or a USB flash drive bootable installer. You have to choose the language, the license type (Home or Pro), and the OS-bit (32-bit x86 or 64-bit x64). If you are unsure, select Windows 10 Home and download both x86 and x64, which requires about 6GB of space. You also must insert a USB drive before the tool begins the execution. I prefer this way rather than upgrading through Windows Update, because the latter seems to take a longer time to download the files. In addition, I can re-use the USB installer to install on other computers without downloading all over again. So far, all my upgrades have been successful, though I have noticed a few non-critical bugs, which seemed to go away after updating drivers and software or doing a reboot. Do check with your computer manufacturer’s website for any information regarding the Windows 10 compatibility. The one major reason I find that makes the upgrade worthwhile is that Windows 10 has converged the user experience back to the good old desktop and made it more touch friendly without sacrificing mouse inputs. How did Microsoft make that possible? In Windows 8.1, consumers who prefer traditional desktop have problems to navigate easily with touch. On the flip side, the touch-centric Modern UI part of the OS is so limiting compared to the desktop that traditional Windows users do not like to use it. With the new Windows 10. There is no more separate Modern UI. Everything is accessible from the desktop. Modern apps will appear as resizable windows with touch design elements, making it more enticing to check out the live tiles without disrupting my current work screen. 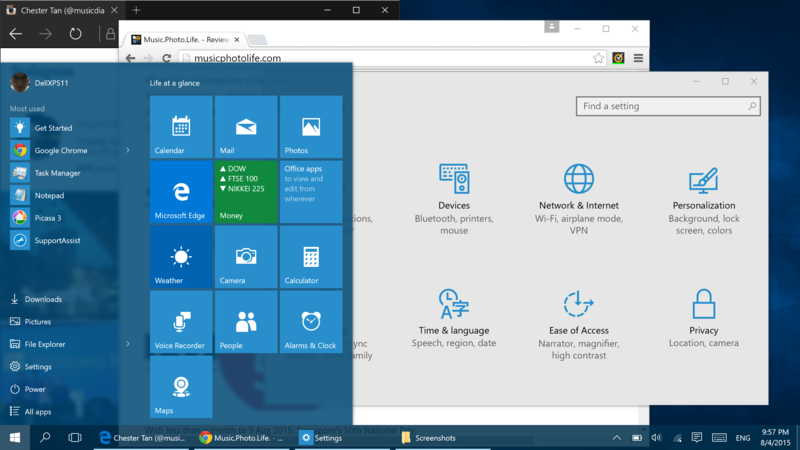 The Start Menu is revamped to show apps in live tiles as well as the traditional app list. The notification slide-out drawer (“Action Center”) is larger and optimised for touch. Like smartphones, each setting is shown as a square icon that is coloured when enabled. Some of the taskbar icons is based on the new Windows 10 UI and will pop-up the options in large touch-friendly display. And like smart devices, battery indicator shows remaining percentage and time. If you go tablet mode, all the windows will be auto-resized to full-screen, the apps on the task bar disappears, the start menu goes full screen. You can also choose to switch back to the normal multi-window desktop mode by swiping out the Action Center notification drawer and disable the tablet mode. 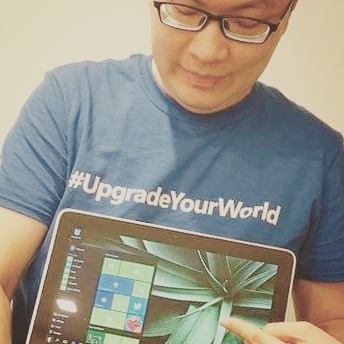 Windows 10 also auto-detects the tablet mode in devices like the Lenovo Yoga series. I really like how Windows 10 marries the desktop with touch-optimized elements, offering the best of both in perfect harmony. Microsoft has improved the desktop to be relevant in today’s touch-centric UX without deviating from the familiar desktop. 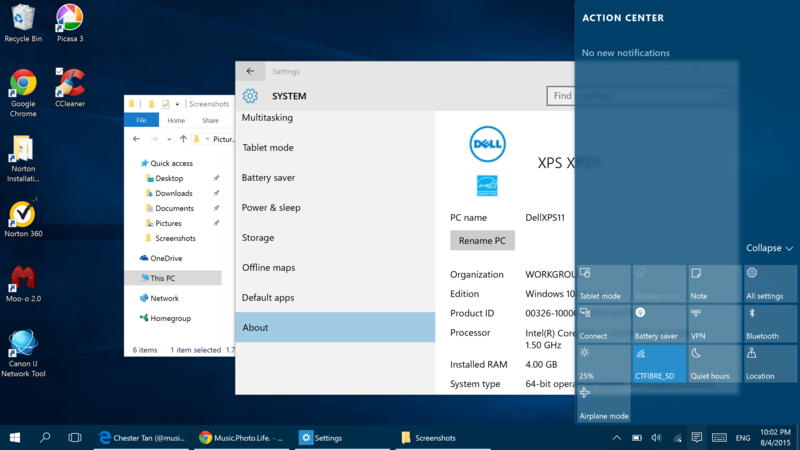 For instance, clicking the “Settings” from the Action Center will bring you to a new Windows 10 menu to make changes to your Windows OS. But if you prefer the old Control Panel, you can execute the traditional program. Either way, you will end up changing the same setting. 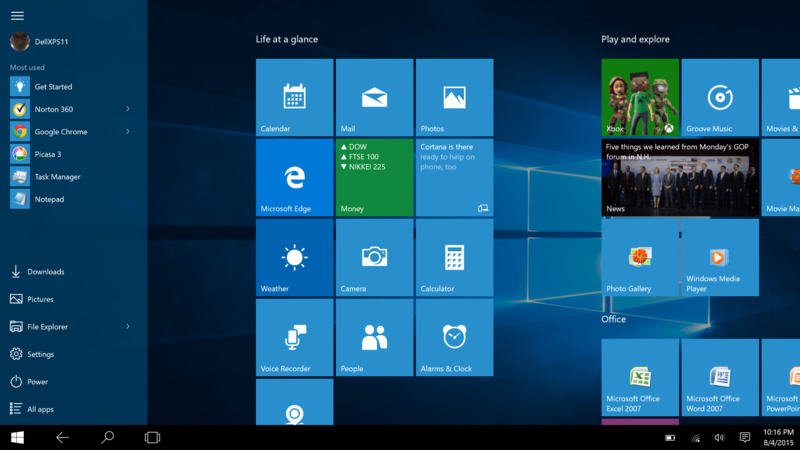 Although Windows 10 brings back the Start Menu, it is entirely different, though in a good way. Instead of the vintage “Program” menu, you add your apps as live tiles just like Modern UI. There is great control in arranging the apps, in various tile sizes and in groups. But if you have too many apps and feel overwhelmed with the live tiles, don’t forget you can easily search for the app just by typing when the Start Menu is opened. Or you can tap on the Search icon next to the Start Menu. Thanks to the way Windows 10 runs the Modern apps as resizable windows, I am more receptive in using the new apps with Modern UI. For instance, I don’t mind using the new Groove Music app to play music instead of the old desktop Media Player, or browsing photos with the built-in Photo viewer. Although the traditional desktop apps may have more features, the new Windows 10 apps are more touch-friendly, encouraging me to interact with the content via touch instead of using mouse. If your current computer is touch screen, I recommend that you upgrade to Windows 10, so that you have more reasons to make your fingers work for you. 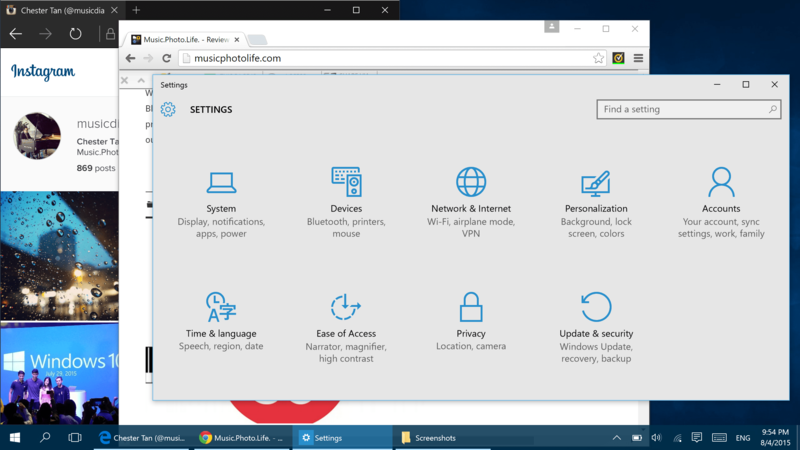 Windows 10 also makes it more palatable to use Modern UI apps. I am so pleased with the new Windows 10 that I have already upgraded 3 computers. Nevertheless, risk-adverse consumers or those who really hate bugs should stay away. Read why you should not upgrade. What do you like about Windows 10? Do share in the comments below.